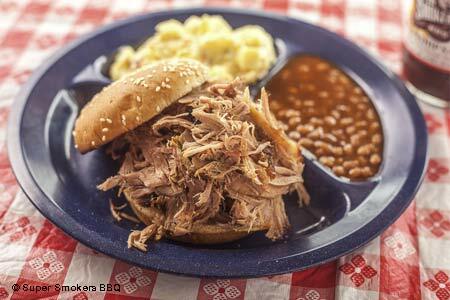 This barbecue champion is easy to spot in Eureka. : You know a barbecue restaurant is serious about its product when it offers bottles of its famous sauces in various regional flavors. The spicy-sweet Championship sauce is a favorite around St. Louis where, generally speaking, barbecue means pork. Super Smokers does a fine beef brisket. We like to pair the tasty sides with non-traditional fare from time to time: barbecue-topped nachos, BLTs with smoked bacon and club sandwiches with smoked turkey or chicken. For dessert, you'll find cookies and sweet bread pudding.